Anne Frank and her older sister, Margot, were among the estimated 50,000 who perished in 1945 after arriving there from Auschwitz. Looking through the barbed wire of the Bergen-Belsen concentration camp, 14-year-old Nanette Konig could barely recognize her friend and classmate from Amsterdam, Anne Frank. Both girls had been caught by the Nazis in the Dutch capital and were sent to starve to death in a place Konig describes today as “hell on Earth.” Both were emaciated when they saw each other again in different sections of the same German camp in 1944. Otto Frank, who edited the diaries his daughter wrote while the family was in hiding into the best-selling “The Diary of a Young Girl,” met Konig in 1945 at a rehabilitation center in eastern Holland. Konig, who was 16 and weighed only 60 pounds, was brought there following the Allies’ liberation of Bergen-Belsen — “a hell where people were not exterminated immediately, but died from hunger, dysentery, typhus, cold, exhaustion, beatings, torture and exposure,” she says. Yet Konig was one of the lucky ones to survive. Anne Frank and her older sister, Margot, were among the estimated 50,000 who perished at Bergen-Belsen in 1945 after arriving there from Auschwitz. Their mother, Edith, died at Auschwitz a month before her daughters, just three weeks before the Red Army liberated the death camp. 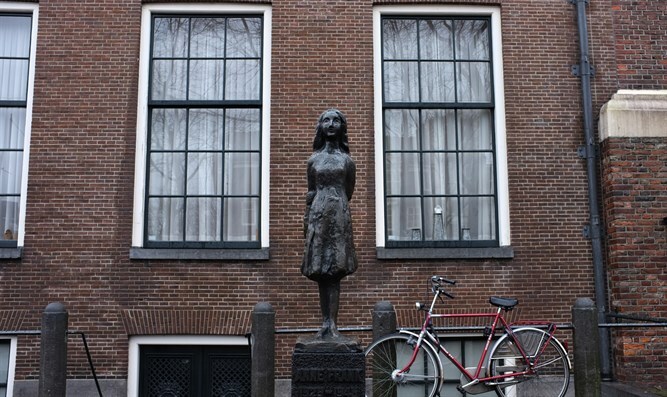 Listening to her stories and seeing her emaciated physique “visibly caused Otto Frank a lot of pain,” Konig recalled. But unlike most of them, Konig also witnessed Anne “change into an adult” in a matter of weeks at Bergen-Belsen, she said. “The Diary of a Young Girl” is perhaps the world’s most-read manuscript about the Holocaust; it has been translated into 70 languages in dozens of countries. Gradually, Konig began speaking at schools – first the ones her grandchildren attended. Then she was invited to speak about the Holocaust on Brazilian television and other media. She went on to speak at schools in the United States and Europe, and give interviews to leading media in her native Netherlands. In 2015, Konig published a book in Brazil titled “I Survived the Holocaust.” It has since been published in Dutch, Portuguese and Spanish. She said she is looking to have it published in English as well.